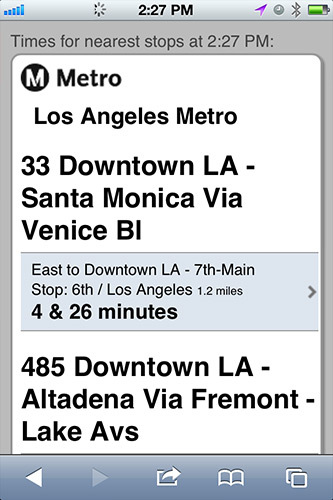 A round-up of notes on Metro's mobile app – Go Metro Los Angeles. What? 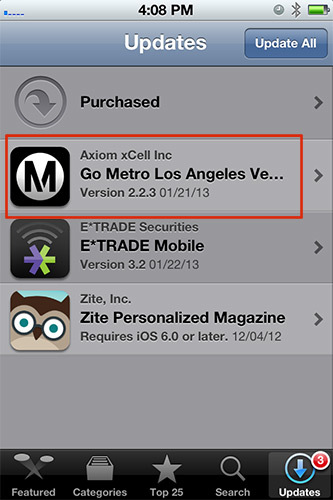 You didn't know Metro had a mobile app, go get it — it's FREE! 1. A new version is available for download for iPhones, iPads and Androids. If you already have the app, you should have received an update notice on your respective devices. Customers pointed out the last update had a strange error of displaying arrival times out of order. Metro mobile developers tracked down the bug and quickly fixed it — however, submitting changes to the App Store and waiting for approval is another story. We appreciate all the feedback coming in via the app, emails, Twitter and Facebook. 2. Metro's mobile app has been downloaded more than 100,000 times by mobile users. Last checked — just over 55,000+ downloads for Android devices and 57,000+ downloads for iPhone devices. If you currently have the app, I'd love to hear from you — what do you like and hate about the app? What would you like to see in the future? 3. There are no current plans to build a Windows or Blackberry version. Sorry Windows and BB users — this is not out of preference, but rather budget and resources. Our online metrics indicate both Windows and BB customers make up less than three percent of online usage. BTW: as of last month (Dec 2012), over 50 percent of all web traffic visiting metro.net is coming from a mobile device — almost equally split between Android and iOS. Fret not, there are alternatives for Windows and Blackberry users — have you tried Metro's mobile website, m.metro.net? (Please note, I am using an iPhone for easy screen captures. It's too difficult to take a screen grab or use apps that provide that feature for Android — you need root access to your device and this is too much effort for an image — now you know). On any mobile browser, enter m.metro.net into the address bar. 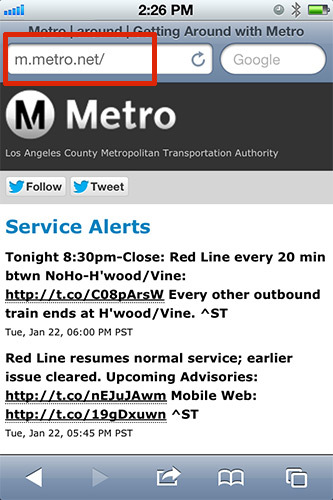 The first thing you'll notice are Service Alerts (@metroLAalerts via Twitter) front and center; we also placed the Twitter 'Follow' button atop so you can follow, and feel free to 'tweet' us with a comment or just a shout-out by clicking the 'Tweet' button. 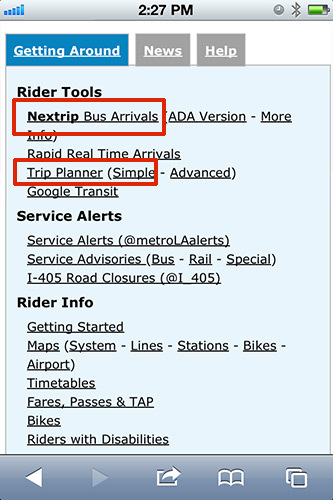 Scroll down just a tad and you'll see transit system links; specifically Nextrip Service and various Trip Planners. Links to Nextrip, various Trip Planners, and service info. 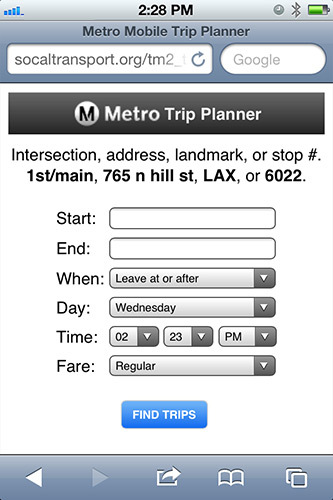 Clicking on the Trip Planner will take you to Metro's text-only Trip Planner for mobile devices. Enter your Start and End location, and select other preferences. Clicking on Nextrip will take you to Nextrip's mobile web application. Upon landing on the page, it will ask to use the device's location. Click 'OK' and the web app will collect the closest Stops and Lines within your vicinity. Nextrip mobile web app asking for your device GPS location. Stops and Lines closest to your device location. it would be really nice if there was a “next train” arrival time in the app…i always wondered why that wasn’t possible to do..
Nextrip for Rail is in the works right now – we’re targeting late Spring for go live. One thing that I have suggested before is that when you download the maps, they also include the service timetable. I don’t always want to use the Trips feature because the vast majority of the time I know how to get where I’m going, I just need to quickly check the frequency of a bus, or the first/last trip, etc. Is there a way I can find that somewhere in the current app? Next step, redesign the TAP website and allow TAP card holders to add fare to their card via the smartphone app! This is the same “app” that FREEZES UP, and has to be CONTINUOUSLY DELETED AND “RE-INSTALLED”, right? And there is NO WAY TO CONTACT “Axiom xCell” about this! WHY does the MTA utilize this INFERIOR application? Can you provide your mobile info to this email – webmaster@metro.net – so we may troubleshoot your problem? Please include mobile device, operating system, and which screen is causing the freezing. First trip, last trip, short line, interline, approx time the bus I am now riding will arrive at my destination …….. paper timetables are far from obsolete.